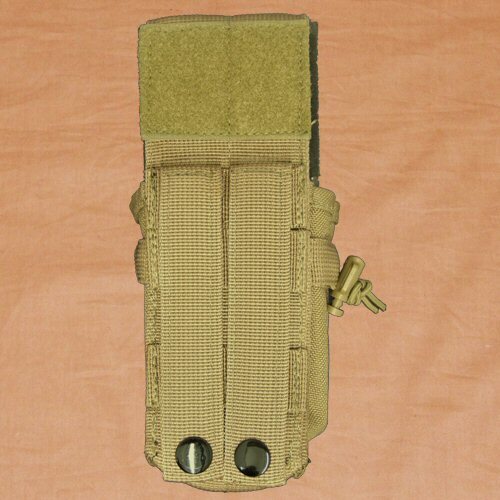 The Bulle MOLLE M4 Triple Mag and Double Pistol Mag Pouch is built around a single mag pouch which is capable of carrying 3x M4, M16 or SA80 magazines, 2x AK magazines, 2xM14 magazines. It also has the additional feature of being able to take 2x standard pistol magazines or small utilities in front of the main carrying compartment. The pouch has an extra long velcro flap to enable all contents to be covered and protected from damp and dirt coming from the top and front of the pouch. Extra velcro is provided on the top of the pouch lid to enable the lid to be retained in an open position where speed is more important. The pouch measures approximately 150-195mm tall, 75mm wide and 70mm deep. The top of the body of the pouch is fitted with double looped elastic shock cord with sprung toggle adjustment to help stabilise the contents of both the main body and the front utility pockets in the pouch. 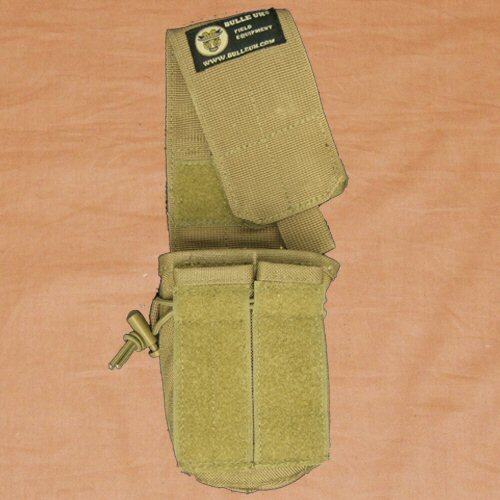 The bottom of the pouch is fitted with a MOLLE loop to allow for attachment of small utilities or a bungee tied through several multimagazine pouches to stabilise the weight of the ammo load from the bottom. The pouch is constructed mainly from extra tough Cordura web material, with sides and front made from lighter weight 1000D Cordura nylon fabric, internally PU coated for water and dust resistance. The rear of the pouch is fitted with 2 MOLLE vertical straps and additional MOLLE horizontal straps for interweaving onto the MOLLE base. The vertical straps are finished with press studs to the body of the pouch on the rear. 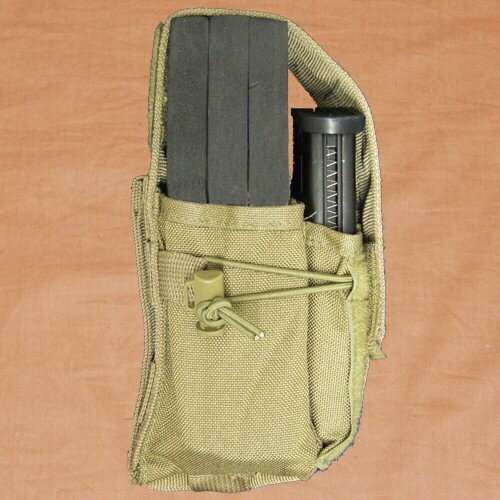 This pouch is an excellent way of carrying both rifle and pistol ammo loads in one, space saving package. All plastic toggles and buckles are military specification Duraflex UTX Stealth parts which offer better performance, durability and heat resistance over unbranded buckles. Please note that price is for ONE pouch only. Accessories shown are for illustration purposes only and are not included. View of the rear of the pouch showing the integrated MOLLE webbing and press button closure. Also on the right hand side is the plastic toggle for adjusting the elastic shock cord. 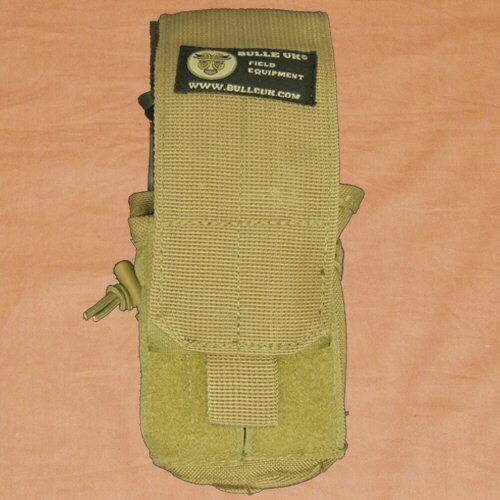 A side profile view of the pouch showing how the three rifle magazines and the two pistol magazines are bound together with both the velcro flap and the elastic shock cord. The overall depth of the pouch is not overly great considering the load being carried. Front view of the pouch showing the double pistol magazine pockets. Also shown is the extra velcro which enables the top lid to be retained in an open position.